Omnirax is a design/build furniture company with CAD/CAM manufacturing capabilities. Virtually everything we’ve made since 1998 can be replicated with 0.005″ precision. In a sense, this makes everything we’ve produced over the last 16 years, a “product”. What you see on the product pages are actually “base models” and their most popular variations. In fact, we’ve made many, many more designs than can possibly be shown individually, with a multitude of features designed to personalize the working environment just for your facility. We built the Phoenix Line of production Radio furniture in response to requests from the marketplace to provide signature Omnirax designs at a lower price point. We figured the way to achieve it was for us to invest in a basic range of offerings derived from proven custom designs. In doing so, we have been able to offer furniture at roughly half the price of our custom work without any sacrifice in materials or workmanship. The Phoenix line consists of basic configurations for Air, Production and Talk Studios. But all of them are really just suggestions of what is possible for us to do for you. What we call Semi-Custom is a modification of these existing or already produced designs – variations on a theme if you will. Pricing will be determined by the amount and complexity of the additions or modifications we make. The advantage of Semi-Custom is that you get a personalized product for a modest additional cost. In order to get started, call and speak to one of our product specialists. 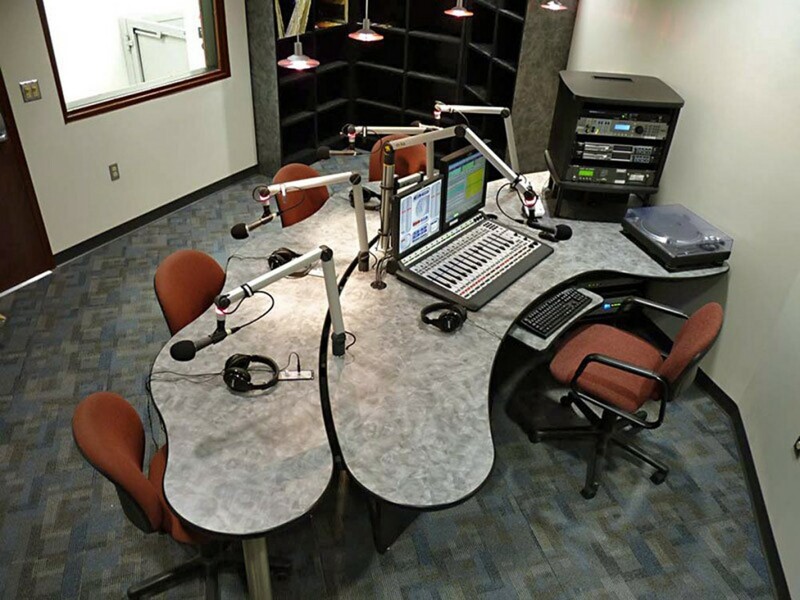 In the Broadcast arena, practically 90% of what we sell is custom furniture because no two spaces are alike and most operations have their own unique personalities. We excel in what we call Collaborative Aided Design: drawing on our expertise combined with a thorough exploration of your needs to build you exactly what you want. How many people: host/operator + # of guests, co-host etc.? Preferred orientation, if already determined? Camera angles if you’ve thought about it. Point of entry for Power / data (i.e. is there a wall to touch, or do we come up thru the floor)? Console make/model, size, will it penetrate the counter top? Height: sit-down (+/- 29.5″³) or stand-up (+/- 36″³)? # of lower racks (sit-down = 13u / stand-up = 16u)? # of above counter racks & spaces per rack (6, 8, 10 & 12u are all typical, usually raised 8″³ above counter height)? # of computer monitors per person? # of keyboards (are keyboards wired, cordless, KVM’d)? A careful consideration of these factors will prepare you for a conversation with one of our product specialists or a consultation with our designers. Together you will explore what’s possible and what it will take to make your dream studio a reality. Need more than one? Producing custom designs in quantity significantly drives down unit costs. Achieve enough scale and you can easily get custom products at production prices. Significant savings accrue immediately. In our world, design and development is the most expensive. Next is the time it takes to fully assemble, fit test and document a custom product. The minute you get one more unit, these costs are cut in half! If you order three more units, these costs are cut by 75%! And so it goes. Collaborative design, careful prototyping, consistent production runs, clever packaging and thorough documentation makes purchasing in quantity from Omnirax a value-added and satisfying experience. You always get what you need and more than you want at a price you can afford. Copyright 2015 © Omnirax Furniture Company.